(b) Snagging is prohibited. Snagging is defined as impaling or attempting to impale a fish in any part of its body other than inside the mouth by use of a hook, hooks, gaff, or other mechanical implement. This definition does not include activities otherwise authorized under these regulations for the lawful use of a gaff, bow and arrow, or spear. (c) It is unlawful to kill, or retain in possession any fish which has not voluntarily taken the bait or artificial lure inside its mouth. Any fish not taken pursuant to these regulations, shall be released immediately back into the water. No person shall possess or use a gaff in inland waters, except that a gaff three feet or less in length may be used to land legal-sized fish only by anglers fishing from a boat in the Sacramento River main stem below Deschutes Road Bridge. 2.08. Special Fishing Methods and Bag Limits –Barrett and Upper Otay Lakes, San Diego County. (a) Only artificial lures with barbless hooks may be used. (b) The bag limit for all species is zero. 2.09. Possession of Illegal Gear. Except as otherwise provided, no person shall use or possess, except in his or her home, any landing gear, any nets, except standard landing-type dip nets not exceeding 36 inches in diameter across the net opening and 60 inches in net length/depth, excluding handle, gaffs or spears within 100 yards of any canal, river, stream, lake or reservoir. Non-electronic underwater viewing devices may not be used for taking fish except under the provisions of Section 2.30. 2.10. Hook and Weight Restrictions. (a) Definition of Gap: For the purposes of this section, “gap” means the distance measured from the point of a hook to the shank. (b) Maximum Gaps and Gear Rigging for Rivers and Streams unless otherwise provided (does not apply to lakes and reservoirs, the Sacramento-San Joaquin Delta (see Section 1.71 for definition of the Delta), and the Colorado River). 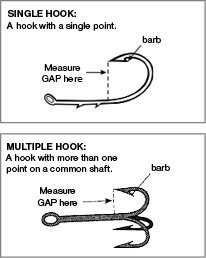 (1) No person shall use any single hook with a gap greater than 1 inch or any multiple hook with a gap greater than 3/4 inch. (2) It is unlawful to use any hook which is directly or indirectly attached closer than 18 inches to any weight exceeding 1/2 ounce. (3) It is unlawful to use any multiple hook or more than one single hook on non-buoyant artificial lures exceeding one ounce. (4) It is unlawful to use any weight directly attached below a hook. (c) Maximum Gaps for the Sacramento-San Joaquin Delta (see Section 1.71 for definition of the Delta). 2.12. Special Fishing Methods-Shasta County. (a) In all waters of the Fall River Valley downstream from Thousand Springs Road, in the Pit River from the confluence with the Fall River downstream to Lake Britton, and in Hat Creek from Hat No. 2 Powerhouse downstream to Lake Britton, western suckers may be taken by hand or hand-thrown spears only by enrolled members of the Pit River Tribe. (b) Open Season: January 1 through April 15. (c) No fish other than western suckers may be speared, and all fish other than western suckers captured by hand must be immediately returned live to the water. (d) No other fish may be possessed along with western suckers as part of a mixed bag. Lights may be used when fishing at night when and where such fishing is permitted. Lights may be used on or as part of any fishing tackle (this supersedes Section 2005 of the Fish and Game Code). Fish may be taken beneath the ice during the open season for that water. 2.25. Bow and Arrow Fishing. (1) Designated salmon spawning areas (See Fish and Game Code Section 1505). (2) The Colorado River District where only carp, tilapia, goldfish and mullet may be taken. (3) See bullfrogs (section 5.05). (4) The East Fork of the Walker River between Bridgeport Dam and the Nevada State line where only carp may be taken. (3) Butte Creek (Butte Co.). (4) Feather River below Oroville Dam (Butte Co.). (5) Designated salmon spawning areas (See Fish and Game Code Section 1505). (c) The Kern River from the Kern-Tulare county line upstream to the Johnsondale Bridge for carp, goldfish, western sucker, hardhead and Sacramento pikeminnow, from May 1 through September 15. 2.35. Taking Fish near Dams, Fishways, Screens and Egg-Taking Stations. (a) Any fishway or any egg-taking station. (b) Any dam or any weir or rack which has a fishway or an egg-taking station. (c) The upstream side of any fish screen. Fish may be taken upstream or downstream from any dam that does not have a fishway or egg-taking station (this supersedes Section 5502 of the Fish and Game Code). 2.45. Computer Assisted Remote Fishing. (a) It is unlawful to take or assist in the taking of any fish in or from this state, by computer-assisted remote fishing. (b) It is unlawful to establish or operate a computer-assisted remote fishing site for the purpose of taking any fish from or within this state. (c) For the purposes of this section, “computer-assisted remote fishing” means the use of a computer or any other remotely controlled device, equipment, software, or technology, to remotely control the aiming or discharge of any weapon, including, but not limited to, any firearm, bow and arrow, spear, harpoon or any other weapon capable of killing or injuring any fish, for the purposes of taking any fish.